When a patient is placed under general anesthesia, that patient is unconscious and unable to feel pain. This state is often produced using intravenous drugs and inhaled gasses that cause the patient to “sleep.” However, this state is not like regular sleep. While under general anesthesia, the brain does not respond to pain and the patient has no memory of the procedure upon waking. General anesthesia should only be administered by an anesthesiologist or nurse anesthetist. This specially trained medical professional will determine the correct medications and then monitor your breathing and bodily functions during surgery. These medications are dangerous and require the skills of an expert physician. Never attempt to use these techniques at home. 1.Review the patient’s medical record. Before administering anesthesia, the anesthesiologist will review the patient’s medical record. This review process helps to ensure that the medications the patient receives will have the least side effects. 2.Ask the patient about medications. Next, the anesthesiologist will interview the patient to help determine the best types and amounts of medications to administer. The anesthesiologist will also talk to the patient about the potential side effects of these medications. 3.Interview the patient about alcohol, cigarette, and recreational drug use. The anesthesiologist will ask the patient about his or her current use of alcohol, cigarettes, and recreational drugs. All of these substances have the potential to affect the way that a patient responds to anesthesia, so it is crucial for the anesthesiologist to learn this information. 4.Confirm that the patient has abstained from food and fluid as instructed. Doctors instruct patients to abstain from food and fluid for a specific amount of time before surgery. However, the anesthesiologist will often confirm this information. 1.Place an IV. 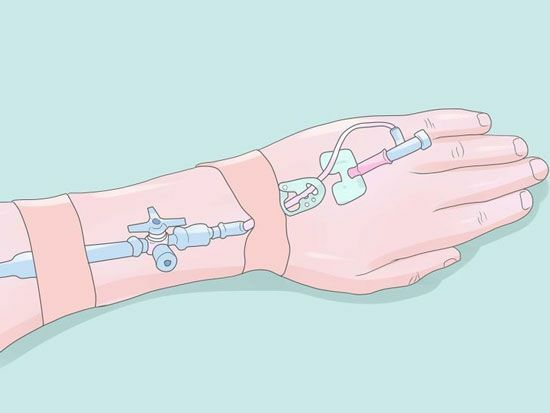 Prior to being taken to the surgical suite a nurse will put an intravenous line (IV) into the patient’s arm. 2.Intubate the patient. Patients are also intubated after they are no longer conscious. 3.Be aware of the potential complications from intubation. Complications from placing the tube down the esophagus toward the stomach instead of the lungs will result in inadequate oxygenation, brain damage and possibly death. For this reason a qualified and experienced physician places the endotracheal tube and checks placement before the start of surgery. 4.Take extra precautions if the patient is at risk for complications from intubation.